Nordstrom increased revenue and sales by 5% -- valuing the apparel retailer at a whopping $14 billion. Unlike other department stores, Nordstrom cares more about getting the right products in front of the right customer whereas others are still stuck on the traditional show-everything-to-everyone mentality. The brand prompts its first-time digital shoppers with a personalized quiz and then applies this data to the customer’s shopping experience on every channel. Brick-and-mortar locations access the data through mobile beacons, which signal when a nearby store stocks an item in a customer’s digital shopping cart. Staff can access customers’ online browsing data to enhance their highly personalized in-store shopping service. On the Nordstrom app, customers can check rewards and book reservations, as well as view the wish lists of friends and family. While Nordstrom doesn’t have a digital personal shopper, the ‘frequently bought together’ section feels like a personal shopping experience with thoughtfully curated selections and references to extensive and specific fit and size reviews. Nordstrom’s website UX is truly best-in-class with a standout variety of recommendations. 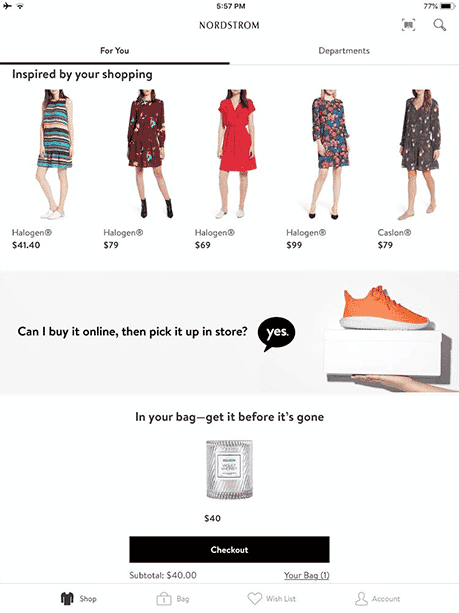 While Nordstrom doesn’t have a digital personal shopper, appearing just beneath products is a thoughtful complete-the-look style set of recommendations, even considering specific fit and sizing from customer reviews. 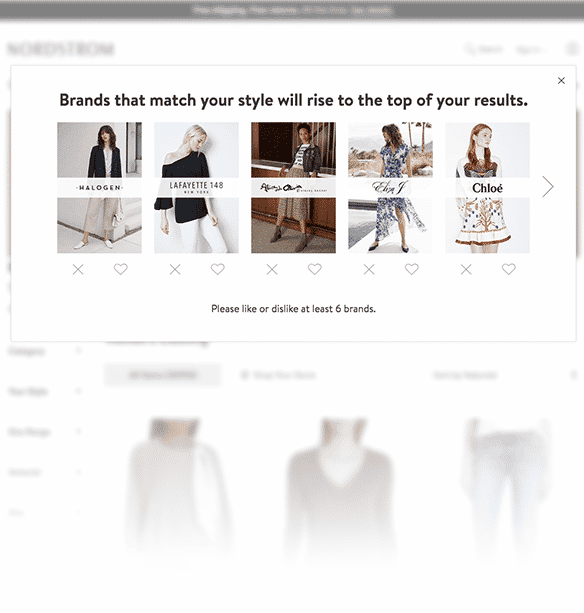 Nordstrom’s mobile app is fully-loaded, with the ability to book store appointments, easily navigate thousands of SKUs, and a dedicated “For You” page featuring recommendations, cart reminders, and curated edits and content. Nordstrom is renowned for its customer service that threads through digital properties. Nordstrom prompts its first-time digital shoppers with a personalized shopping quiz for men and women. Nordstrom then applies this data to a shopper’s experience across channels. Personalization is a long-term strategy. Find out where to start.